Jamie Evans, Adam Goodwin, Esme McCall & Joseph Shaw. Curated by Clare Gomez. The exhibition VARIOUS STAINS will involve installation, kinetic sculpture, painting, performance and sound; drawing associations to Dadaism, technology, philosophy, psychology and politics. 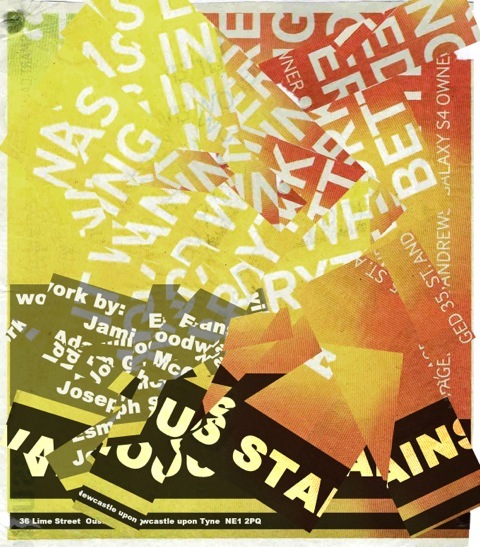 Evans, Goodwin, McCall and Shaw’s practice detach reason and thrive in idiosyncrasy, moving towards the exemplification of the mechanics of otherness or functionlessness to highlight the absurd. Each artist plays on the human desire to explore and define these subjects. Curator Clare Gomez will configure elements of each artist’s work in to a unified whole, encompassing their individual concepts. Presentation of an amalgamation of sections of each of the artists pieces to form a more in depth comment of the human psyche. As part of a wider audience development plan, 36 Lime Street is proud to present a series of new projects for the fifth year of its gallery space. A new programme of exhibitions and events has been co-ordinated to run from April 2015 through to January 2016 which will encompass painting, sculpture, installation, drawing and three-dimensional design.